Our software is completely safe to use with QAD because we use genuine QAD business logic to perform tasks. Data Loaders provide regular Excel template files equipped with VBA macros which are connected to built-in action buttons. These action buttons allow users to download data from QAD, work with the data easily in Excel, and then quickly and without IT help, upload modified data back to QAD. When a user clicks on an action button, it creates a programming call through a TCP/IP connection to the QAD server where Data Loaders run a multi-thread Java listener. This listener launches a native progress 4GL session containing 32 Soft’s code which executes standard QAD programming. 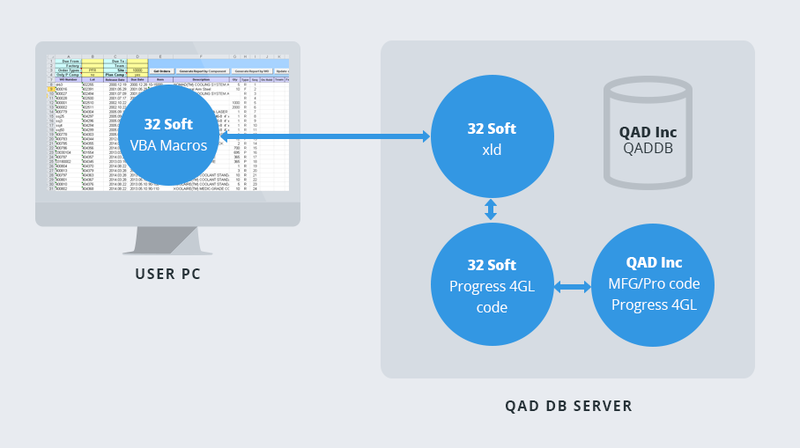 When a user clicks the DOWNLOAD or DRILL DOWN buttons, Data Loaders progress program uses QAD programming to extract the data and re-direct the output to the Excel window. When a user clicks on the LOAD button, Data Loaders scans the Excel data and validates it using genuine QAD logic. If an error is found in the data, cells with errors are instantly highlighted, so the user can quickly identify and correct any problems and then simply click the LOAD button again. Our program will then launch a QAD program and load the clean data using a CIM load mechanism in the background. That means your Excel data is automatically entered into QAD just as if it had been manually keyed in. Once your data is sent to QAD, the output records will again be read prior to the final upload to ensure there are no errors. If errors are found, an error report will be generated and the upload will be terminated. This ensures that only error-free records are loaded and no partial upload of batched records ever occurs.